According to a new survey by Neatlynamed, manufacturers of labels for children's clothes and belongings, parents spent £1589 replacing items lost by their children before the age of ten, and spend nearly two days looking for them. The most commonly lost items are hats, jumpers and cuddly toys, and 62% of the missing possessions are never found again. I must admit that we've generally been quite lucky when it comes to not losing things. I've always been very careful to label as much as I can - and this is a good idea as according to the survey 64% of items that were lost and then subsequently found had name labels. It definitely worked out well for us last term when Harry lost a new, rather expensive PE jumper. It disappeared for a few days but eventually turned up on his peg. I don't know where he left it, but fortunately the label meant that it was returned safely to him, rather than ending up who knows where! As we prepare for the start of term I've been busy buying all the new uniform and other bits that the children need, and making sure that it is all well labelled. According to the survey, school or nursery is the place that children tend to lose things most often, and around half of mothers said that they have known their little ones to lose items within just 20 minutes of getting them for the first time! Neatlynamed provides a range of self-adhesive stickers and name labels designed for children's clothes and other personal items. There are clothes labels, iron on labels as well as shoe and sock labels and stickers for other personal belongings. They can all be personalised with the child's name, choice of colour and an icon. We were sent some of their new Disney themed clothing labels to review. 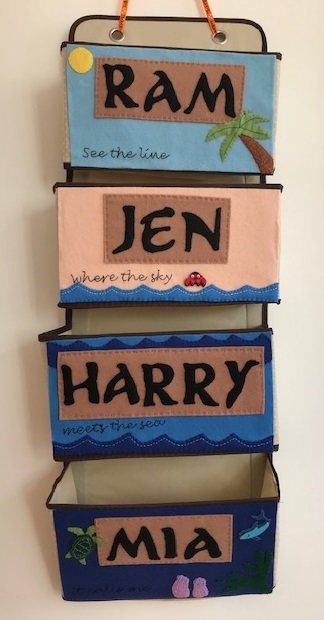 There is space for two lines if you need them, so you can add for example a phone number underneath, and depending on the design you can choose different sizes and styles. You can see the full Disney range of labels here. Mia chose some of the Frozen labels, and Harry went for labels featuring Mickey Mouse and other Disney characters. The labels are designed to be stuck to the clothing care label within a garment. After being in place for 24 hours the clothes can be washed, and they will withstand washer and tumble dryer for about eight months. I was really impressed with the design of the labels, there are plenty of different cheerful designs in different shapes and sizes. They stick really well and I'm confident that they will stay in place. They are also not just great for clothing - I've used them for the water bottles, hats and book bags, and there are plenty in the pack to keep us going. Fingers crossed, everything that goes into school will be coming back! Figures based on a survey by Neatlynamed of 1000 Mums with children aged three to ten. This is a collaborative review.